The strongly rhythmic and richly orchestrated Belshazzar’s Feast has remained one of Sir William Walton's most celebrated compositions. Composed in 1931, it draws on texts from the Book of Daniel and Psalm 137. We are delighted to welcome, as bass-baritone soloist, Matthew Brook, one of this country's leading and most experienced singers. In addition, we are very pleased to be working with Orchestra Vitae, an exciting and relatively new orchestra consisting of young talent from the UK's leading music colleges and universities. As well as the challenges of Walton's fiery score they will also be playing Elgar's magical Enigma Variations and accompanying the choir in Vaughan William's Five Mystical Songs. 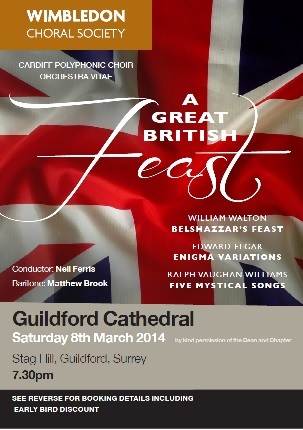 A Great British Feast, then, with music from three of Britain's finest 20th century composers. A seating plan for this concert is shown here to the right to help you with your selection. Just click on the image to open up the diagram. Online (see above right), Guildford Tourist Information Centre (01483 444334) or from choir members.